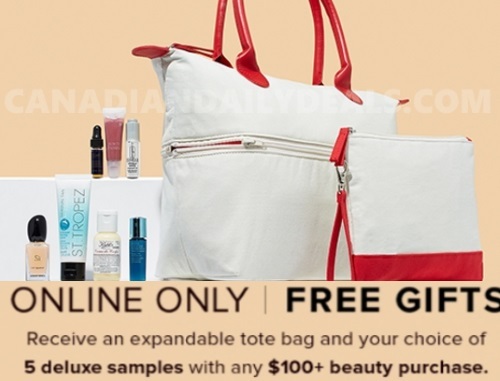 Hudson's Bay Beauty Department is offering a Free Expanable tote bag and your choice of 5 deluxe samples with any $100+ beauty purchase! Plus get a matching cosmetics pouch when you spend $125 or more (total up to $100 value). Also enter the promo code ONLY4U to get $10 off any $75 beauty purchase before taxes. While quantities last. Excludes Hermes purchases. Offer available while quantities last. The tote offer will be automatically added to your shopping cart if you qualify. Available online only.